The early childhood educational system of the municipality of Reggio Emilia, Italy, provides the inspiration and principles upon which the Center is built. Parent’s voices are heard in newsletters, in documentation, in photographs, and in the classrooms. 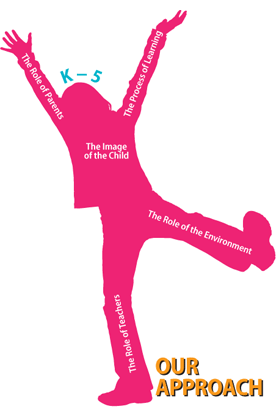 Common Core standards are embedded in an emerging child-centered curriculum. Ongoing collaboration among children, teachers and parents is documented and displayed throughout the building. Ideas and theories of the children are beautifully communicated through clay, wire and drawing materials. Groupings at the Discovery Center are multi-age and flexible, created to support interests, abilities and teaching points. Each student is formally assessed on the Common Core Curriculum three times a year. Each child has Portfolios containing authentic assessments of quality work, representing who they are and how they learn. Creative maps and charts make visible the daily schedule for each classroom. Teachers, parents and children construct knowledge together through well-planned conversation and activities. Children are involved in solving all problems in the school from caring for animals to getting along with each other. Beautiful spaces throughout the school provoke and support learning. The relationship between the inside and the outside of the school is obvious in the lighting, plants and trees. Partnerships are forged between the school and neighborhood organizations. Technology is available to enhance the teaching-learning process. Teachers are dedicated to continuous professional development. The Studio provides a lab for exploration of materials and ideas. Diversity is a celebration made visible in plants, animals, people, and perspectives.